Migration watch; 06.15 – 11.00hrs. An interesting day with some passage and a few arriving migrants. On The move (north unless stated) were 55 Pink-footed Geese, 44 Greylag Geese + 3 south, 6 Shelduck south, 2 Common Scoter, 15 Fulmar + 2 south, 6 Gannet + 1 south, 13 Cormorant + 3 south, 1 Sparrowhawk, 1 Kestrel, 3 Curlew, 9 Black-headed Gull, 1 Lesser Black-backed Gull, 4 Sandwich Tern, 6 Auk sp + 5 south, 4 Magpie + 2 south, 1 Jackdaw, 8 Rook, 46 Carrion Crow + 16 south, 35 Sand Martin + 13 south, 4 Swallow + 3 south, 2 Starling, 1 Tree Sparrow south, 2 Alba + 8 south, 299 Meadow Pipit + 1 south, 2 Chaffinch south, 12 Linnet + 206 south, 3 Goldfinch + 14 south, 1 Yellowhammer south and 2 Reed Bunting south. Migrants in the Long Nab area included 3 Chiffchaff, 1 Goldcrest and 2 White Wagtail. 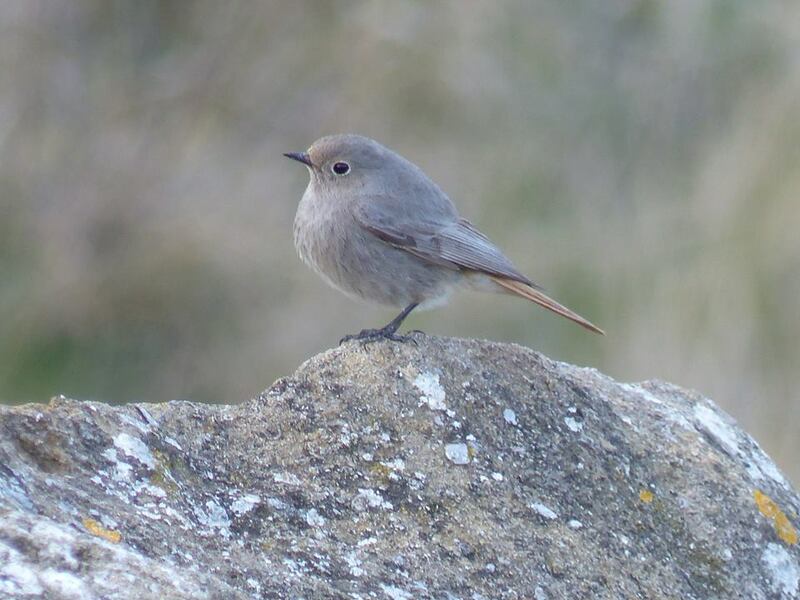 Three Black Redstart were found during the day all of which were females, the first was seen feeding on the roof of Wetherspoons before moving towards Alma Vets, the second was behind the Marine Drive wall and the third on the north side of Castle Hill. A Wheatear was behind the Marine Drive wall, 10 Chiffchaff and a Willow Warbler were on Castle Hill, a Willow Warbler was by Scalby Lodge, a Bar-tailed Godwit and 23 Redshank were in Jackson’s Bay, a House Martin was over Scalby Nab, a single Wigeon was at Scalby Mills and 8 Teal were on Johnson’s Marsh. Three Bottlenose Dolphin passed north in Cornelian Bay at 07.50hrs, after being seen passing Marine Drive and Scalby Mills they arrived at Long Nab at 09.00hrs and passed Cloughton Wyke at 09.17hrs.